“Boy it’s hot!” you tell yourself, as you sit in the shade and sip a cold glass of iced tea while your dog looks pleadingly at you. Clearly your dog is hot, heck you are and you don’t even have fur! More than likely you realize your dog’s discomfort too. 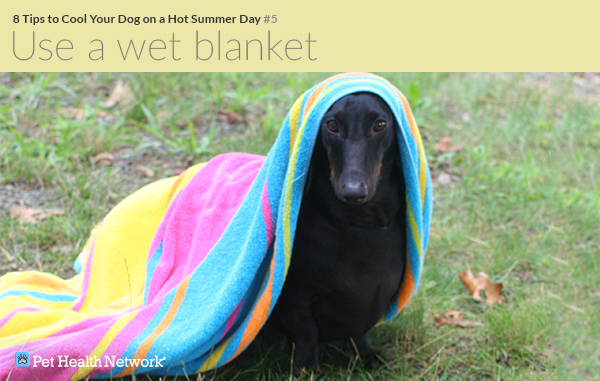 What can you do that will make your dog comfortable and protect him from potentially deadly heatstroke? How can you cool his personal space? 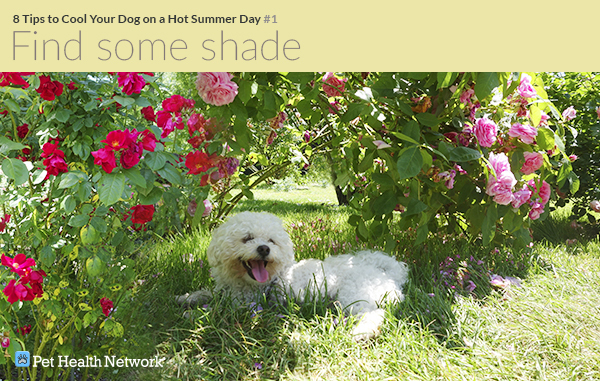 I recommend an outdoor thermometer in the shade to help you find the most comfortable area for your dog. While a large tree may not be available, even a small patio area has room for a canvas canopy. Collapsible shade tents are readily available at home and garden stores and can be folded and unfolded as needed. 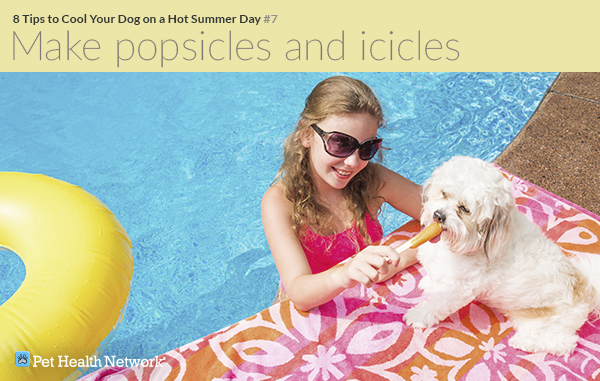 If you are lucky enough to have a pool or be near a lake, you’ll probably be tempted to jump in with your dog. That seems like a logical option if your dog is uncomfortably hot, but be cautious. 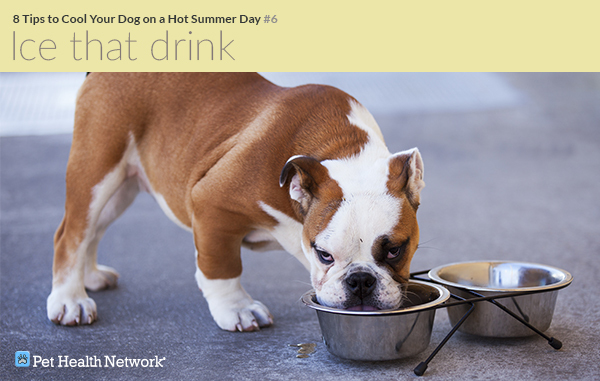 If your dog is really hot or bordering on heat stroke, it just might make things worse. Lowering your dog’s skin and surface temperature too abruptly might actually result in further heating of his internal organs, worsening the overheating of the body’s core. Instead, recognizing that you dog’s feet help with the regulation of body temperature, have him enter the water slowly. Let him stand with just his feet in cold water for a while; ideally, monitoring his temperature with a thermometer. Rectal temperatures lowering to 103F are a good place to stop cooling your pet aggressively. If you don’t have access to a pool or lake, a small child’s wading pool can be placed even on a small patio to allow your dog to simply stand in the water. Remember the foot pads of dogs are one of the ways they can dissipate heat (it’s also one of the few places they sweat). 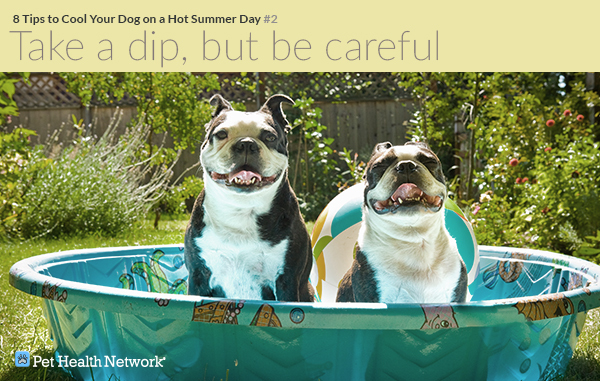 Click here for more water safety tips for dogs. 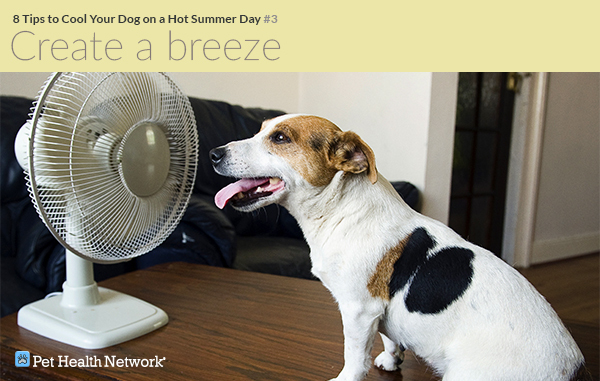 A breeze can make summer heat much more tolerable and simply placing a window or shop fan on the patio will create a great breeze for your dog. You might want one for yourself as well! The breeze or fan is particularly helpful in cooling by evaporation. Unfortunately, since dogs don’t perspire much you may have to simulate this evaporation. Dogs do sweat (but not much). Click here to learn more. Obviously using a garden hose to wet down your dog will help, but it wastes a lot of water, and some dogs are afraid of the hose or could even be injured by the pressure. Instead, consider using a mist creating attachment that attaches to the water supply and sprays a very fine (and cooling) mist of water in an area as small as a few square feet and as large as a patio. These misters are available at home improvement centers and need not be expensive. Many places also sell a small quart sized sprayer, some with a small fan attached. They are great for cooling your pet and yourself. Using a hand towel or a bath towel that has been dampened and kept in the freezer is a great aid for cooling. A bag of frozen peas can be used as an ice bag to cool your dog’s head, or placed on the neck or groin where some big blood vessels live . On a hot day, you take a cool drink. Don't you think your dog would like one too? Simply keep their water fresh and cool it by replenishing it often. You can add ice to the water bowl to help lower the temperature. In my own experience dogs are willing to enjoy a Popsicle or frozen juice bar. If your dog doesn’t like fruit flavors consider making frozen bars with plain water and a touch of beef bouillon. Not my favorite but your dog may love them. 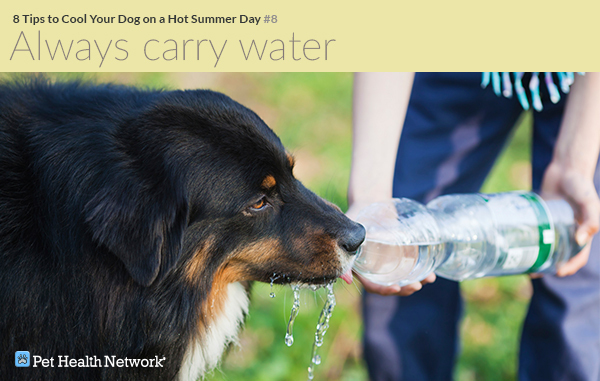 Make sure that whenever you leave home, you carry plenty of water for your dog. A quart of bottled water can easily be frozen and kept cool in an insulated bag. If it is too hot for you it is too hot for your pet. Some days are best spent indoors by an air conditioner. On those days just rent a movie and chill. Be familiar with the signs of overheating and impending heat stroke. 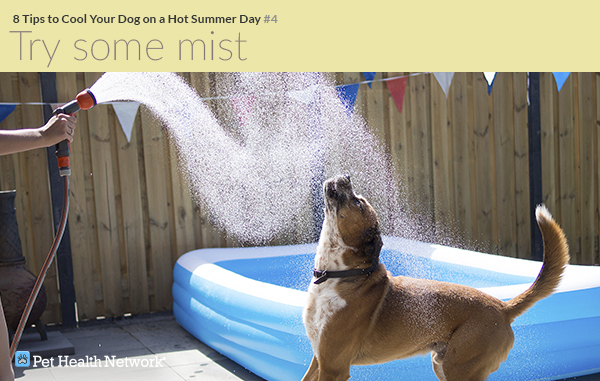 If your dog demonstrates any signs of overheating cool him down gradually and take him to your veterinarian. Remember to never leave a dog in a parked car. Click here to learn just how hot it can get.